I’d prefer the concept of Software Patents to be repealed in it entirety. While there is some logic to that, the US does not have a great enthusiasm for confiscating property in any form, even when that property shouldn’t have been given out. The option 3 outlined in the video – Recruit more Judges and Specialists, is going to be hard to do when graduates to staff the USPTO are also sought elsewhere in industry at more competitive salaries. How about an option 4? Back in the 90’s I read Simon Singh’s Fermat’s Last Theorem (Fermat’s Last Enigma for the US). It was a great romp through the mathematics leading up to Andrew Wiles’s proof, and an easy read for anyone who knows how to tie their own shoe-laces. I throughly recommended it (and Simon’s subsequent work: The Code Book). The strategy specifically, enlist competitors of bogus proofs to disprove the equally bogus proofs of others competitors – for free. There’s a difference though. 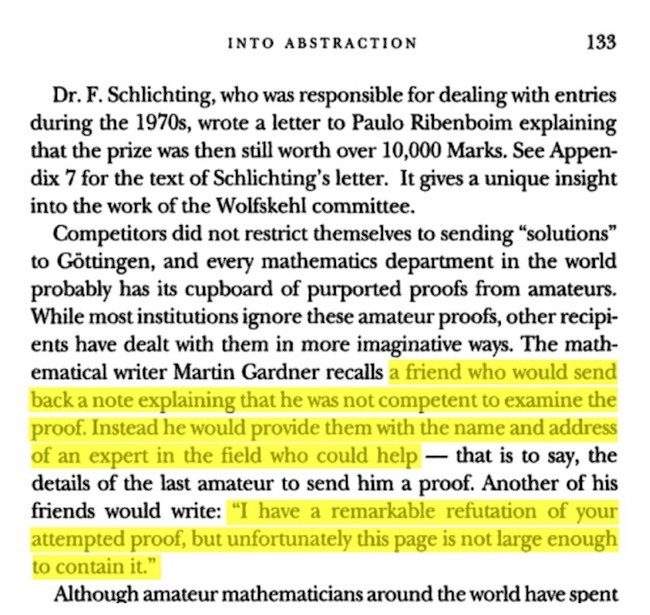 The academic friends of Martin Gardner were effectively and politely dissuading competitors from engaging in follow-up correspondence. The competitor realizes that they themselves don’t have a solution after all, and never mentions their foolishness again. Option 4: a bounty system. Patent applications received electronically. After sitting on it for a couple of days, the patent office encrypts a copy of the application and leaves that effectively in the public domain. It is not at this stage decrypt-able. Other patent authorities (China, Britain, India, etc), receive a copy of it. Perhaps so does a one or more neutral/independent entities (yay Iceland/Switzerland!) in case there is a squabble as to where something was filed first. After a week the decrypt key is released to all. From that moment, the decrypted form of the patent application is visible to the public. Also at that moment, the prize for rejection is up for grabs. The effective mechanical turk we’re talking about could try to critique them. Though you could start with a first-to-succeed model for paying the bounty, you might want to have those applicants pay a fee too (non-refundable) to slow them down a little. Individuals as well as groups and companies would be active in this new field, in the same way that gold farming is an outsourced profession. Of course, if a period of time elapses (say 6 weeks) and there’s no accepted rejection, then the patent is awarded. If someone garbles their attempt at a writeup supporting a rejection, the content writeup is allowed to be reused for someone else’s attempt to reject the patent. Implicitly the correspondence around rejections of patent applications are public-domain (copyright does not apply). The patent office could ask all holders of in-force patents to pay their deposit (potentially long after the patent being awarded) and undergo the community effort to tear them apart, or relinquish their patent (adding to the public domain). Other consequential changes to the current patent system. I applied for a patent on a vertical axis wind turbine (VAWT) in 1992. The application was correctly rejected because prior art that the UK Patent Office found during their search. Since then I’ve found patents in the same design going back to 1895 and dozens of applications since then (that should have been rejected). The UK patent office did not post my application though. Indeed my patent agent suggest a modification that would allow the patent to go through, but I felt the invention had already been done and I declined. Patents are public soon after filing, instead of some year or so later. Rejected Patents become part of the public domain, and can be used in prior art citations to reject patent applications after that. The biggie here is that you get one shot to file a patent. Maybe that needs to be rethought. Perhaps you can refine the patent inside that 6 week window (with additional fees/deposits), but once it closes, it’s gone for ever. Really this is all about greatly reducing the rate of non-inventive applications – applicants will decide to not file, as they can no-longer count on an overrun USPTO, and plan to extort money out of “infringers”. Lastly, I suspect someone else has suggested this already – like my failed 1992 patent.